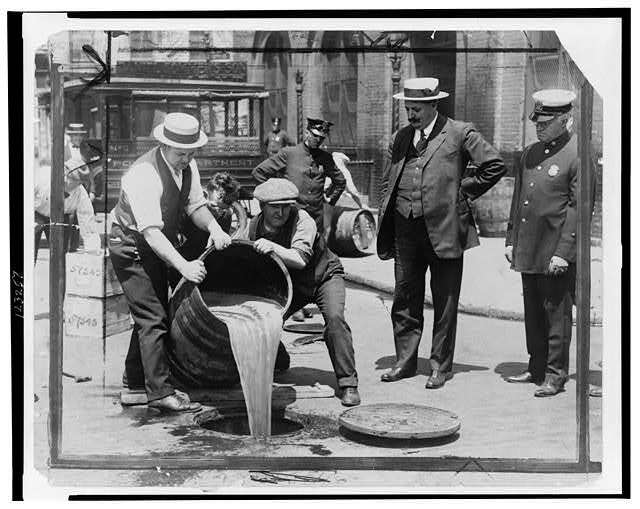 Prohibition only lasted for thirteen years, but it changed America forever. Not only did it have a major impact on U.S. politics, legislation and law enforcement, but it also influenced literature, culture, art and even our everyday lexicon. When the Dictionary of American Slang was released in 1960, there were more colloquial synonyms for drunk than any other word. Most of these originated during the 1920s, the dry decade. Members of the temperance movement may have convinced Congress to outlaw alcohol, but they had a difficult time persuading the public that a liquor free life was the best type of life. In a large and diverse city like New York, it became even more difficult to enforce the moral absolute that drinking was wrong. 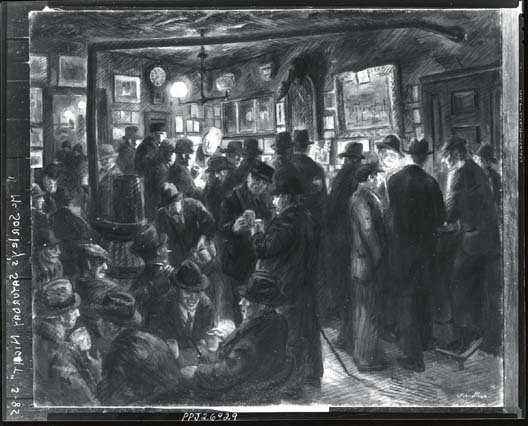 In Greenwich Village, the land of eccentrics, rebels and progressives, the task of controlling these residents drinking habits became difficult. Villagers fought prohibition through speakeasies, bootleggers and general apathy towards liquor enforcement. This fight created new pop culture icons in Greenwich Village and it also had a great influence on the artists and writers who lived in the area. While researching various speakeasies throughout Greenwich Village I realized that many of the owners were very colorful characters. One of the most interesting speakeasy owners is Leland Stanford Chumley. Leland, or “Lee,” as people called him was a man of many trades. The New York Times stated that he was a “Laborer, stage-coach driver, artist, waiter, newspaper cartoonist and editorial writer.” Lee was also an active member of the Industrial Workers of the World (IWW). One of his pamphlets written for the IWW, titled “Hotel, restaurant and domestic workers,” can be found in Tamiment Library. It is believed that Lee purchased property on 86 Bedford St, once a blacksmith shop, in 1926 to use it as a place for IWW meetings. Eventually though, Lee used this property to open up a speakeasy known as Chumley’s. In order to subvert the authorities, Chumley’s was equipped with hidden passages, multiple exits and a door disguised as a bookcase. Chumley’s is perhaps most famous for its clientele though. This speakeasy became a literary hot spot. E. E Cummings, William Faulkner, Eugene O’Neill and F. Scott Fitzgerald to name a few, used to frequent the place . The dust jackets from their books hang on the wall. Chumley’s is even considered a literary landmark. One of the more scandalous aspects of Lee’s life concerns his wife, Henrietta. Apparently, nobody knew that Lee was married, nor did she know that he owned Chumley’s until 1935 when he passed away from a heart attack. Lee was known as a swinging bachelor, so people were shocked to find out that Henrietta existed. Even more shocking was Henrietta’s inheritance of the bar. Following his death she owned the bar and ran it from 1935, until her death in 1960. People claim that Henrietta used to sit at a table drinking Manhattan’s all night until she passed out. Apparently one night people found her dead in her chair. It is rumored that her ghost haunts Chumley’s and because of this it is considered one of the most haunted places in New York City. Chumleys is undergoing renovation at the moment, but should reopen in 2011. .